Watch CustomizerSM walks you through the virtual customization process by first re-designing your existing Pre-Owned Rolex Timepiece or one you’d like to purchase by determining your Case Size, Bracelet Type and Bezel Type. All Custom Accessories are trademarked by Time Delay Corporation. Watch Images shown throughout Watch CustomizerSM are computer-generated examples of our custom accessories virtually installed on the client’s Rolex Timepiece and are not for sale as completed watches. Please note that the image above is sample photo only. This image is representational of the watch you will receive if you decide to make a purchase but is not an actual photo of the customized watch. TIME DELAY does not sell pre-accessorized watches of any brand. 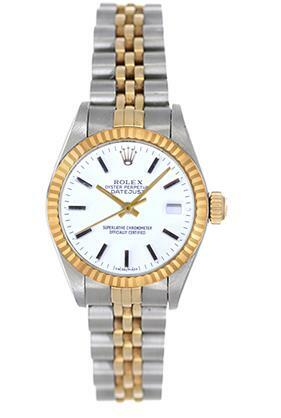 Our business, as it has been for 35 years, is to customize your client's' watches to their specifications. Custom Bezels and Custom Applications to Dials that appear in the Watch CustomizerSM are supplied by Time Delay Corporation. All Custom Accessories are proudly stamped with our TDC Trademark. TIME DELAY CORPORATION is an independent company and is not affiliated with any watch manufacturer or distributor. Application of custom accessories will void the watch manufacturer's original warranty and will preclude factory service. This site,including its owners,operators, and developers, are not affiliated with nor endorsed by Rolex S A, Rolex Watch U.S.A.,Inc.,or any of its subsidiaries, in any way. undestanding agreement and acceptance of the above terms and conditions. You must agree with the terms and conditions to proceed further. Watch Images shown throughout Watch CustomizerSM are computer-generated examples of our custom accessories virtually installed on the client's Rolex Timepiece and are not for sale as completed watches. Please note that the image above is a sample photo only. This image is representational of the watch you will receive if you decide to make a purchase but is not an actual photo of the customized watch. TIME DELAY is not an authorized Rolex dealer nor is it affiliated with the Rolex Corporation or any of its subsidiaries. Rolex is a registered trademark of Rolex Watch U.S.A., Inc.
ROLEX, DATEJUST, DAY-DATE, JUBILEE, OYSTER and PRESIDENT are all registered or common law trademarks of Rolex Watch U.S.A., Inc. This site, including its owners, operators, and developers, are not affiliated with nor endorsed by Rolex SA, Rolex Watch U.S.A., Inc., or any of its subsidiaries, in any way.